jeune tops made by my girls! 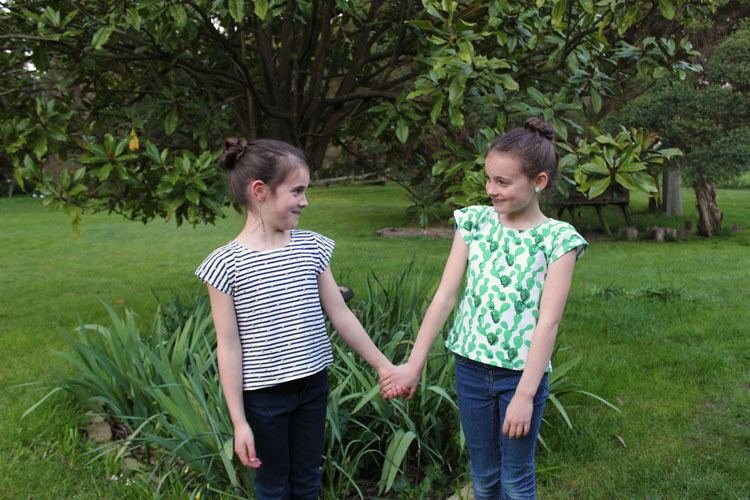 Today I am sharing two sweet tops that the girls made for themselves! We started our September holidays a week ago and I wanted to spend some time sewing a garment each with the girls. 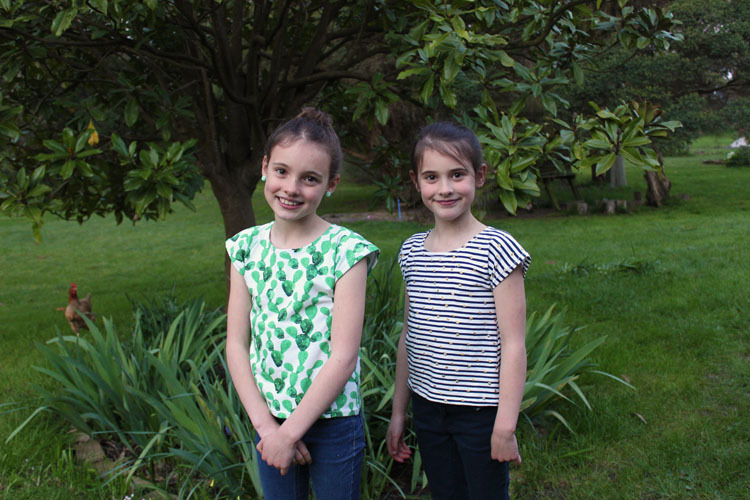 Isabella and Juliette (aged 10 and 8) love choosing fabrics and looking at my designs and having their input. I decided on a simple project for their first garment sewing project. A little T-shirt. I was going to go for an Issie top, but wanted to try using one of my woven patterns in knit. This pattern is the Jeune top from the Jeune twin set pattern. It has been adapted slightly to be sewn into a T-shirt without the original closure at the back. Scroll to the end of the post for the adaptations. 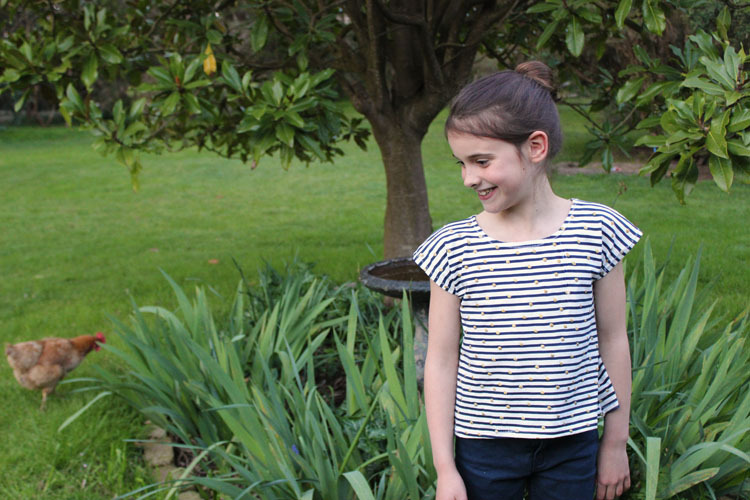 Isabella's top is made from French Terry purchased from Maai design about six months ago. I only had half a metre but since Isabella is small, I just managed to cut her top from it (well, actually she cut it). I love how this top sits and it doesn't crease which is great. Juliette chose a stripey stretch with gold spots I picked up from Spotlight. 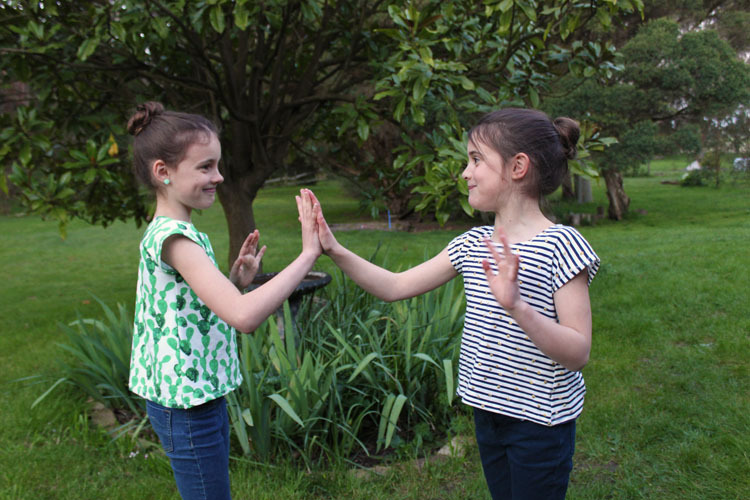 The girls love to play clapping games, like the ones I used to play with my classmates waiting to go into class as a little girl. Some of the songs are still the same! It amazes me how those little songs get passed on. Sewing with the girls went very well. They are super proud of their tops! I did have to help them with each step as they don't quite now how to feed the fabric evenly through the sewing machine, but with practice I hope they can sew one up on their own in the future. I haven't forgotten Emily...she wants to sew a skirt, so stay tuned! Come back to the blog later today to see some more stretch inspiration from the sewpony team! Fabric - Cactus fabric is by About Blue Fabrics from Maai design. Striped fabric from Spotlight. Sewing time - 30 minutes each. 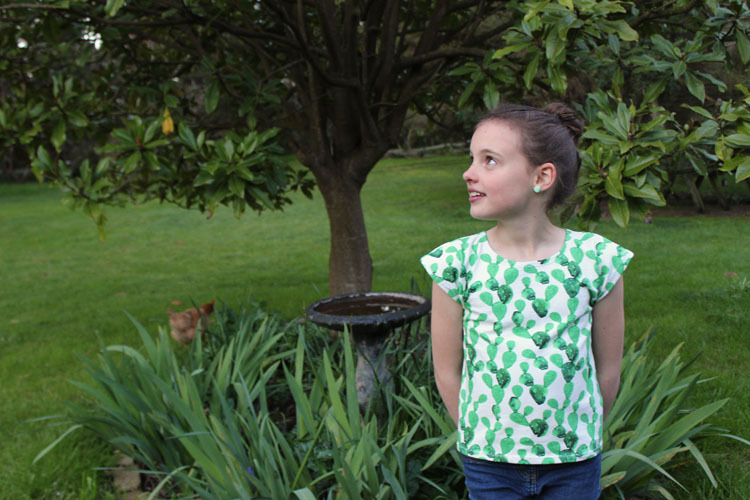 Modifications - To sew the Jeune top as a T-shirt, it's super simple! 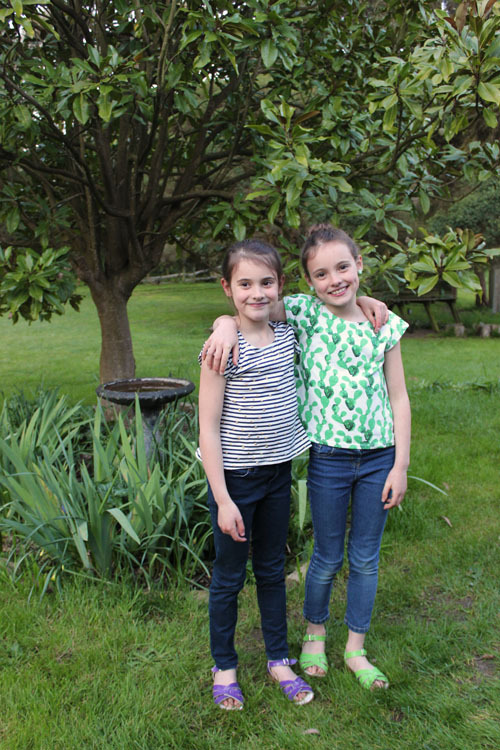 I sized down one size from the girls' usual size (here they wear a size 5 lengthened to size 7). Cut the front piece as per pattern. Cut the back piece by using the front piece but adapting the neckline using the back piece (cut on the fold like the front). I simply hemmed the sleeves and neckline, but you could add neck banding if preferred (trim the 1cm seam allowance from the neckline if you choose to do this). Sewing steps: sew shoulder seams; press; sew side seams; press; hem sleeves from underside with zig zag stitch; press; hem neckline with zig zag stitch; press; hem top with zig zag stitch; press. oh they did a fabulous job Suz! Well done ladies! Sweet! And I love the fabrics they chose, too.